Value for Money: The key to our success (and the high degree of repeat business we enjoy) is the high quality of product and service that we deliver at a competitive price. Proven Track Record: Since December 1961, we have produced an enviable list of very satisfied customers in the agricultural, industrial and commercial buildings sectors; together with a reputation that is second to none. 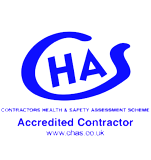 Fully Accredited: We have an excellent Health & Safety record and we employ an in-house Health & Safety Officer. All site operatives are CSCS trained. 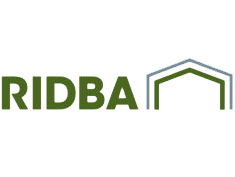 We are recently audited members of BCSA, RIDBA, CHAS, Constructionline and Builders Profile, carrying their assurance of our competence and financial standing. Dependability: Our customers tell us that they can rely upon the A. C. Bacon team to be experienced, dependable, proactive, attentive and genuinely good people to work with. We currently employ over 100 people, including our own detailers, workshop operatives and steel erectors, and have own our own fleet of delivery vehicles, cranes, access platforms and telehandlers - all to ensure that we deliver, as promised. Capability: Our extensive in-house facilities contribute to us achieving the quality and flexibility that delivers projects on time to the required high standards of CE Marking. Our production facilities include state-of-the-art cutting, drilling and punching lines for the fabrication of 100+ tonnes of structural steelwork per week; plus shot-blasting and painting equipment for finishing to individual requirements. Complete Service: Design, detailing, supply, fabrication, erection, roofing, cladding, doors, grain walling - we can provide everything needed for your project. We also have the flexibility to provide specific input in any of these core areas. 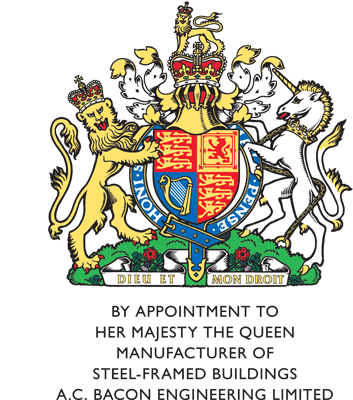 Affiliations: A. C. Bacon Engineering Ltd is a proud holder of the Royal Warrant of Appointment as a tradesman to The Queen for the manufacture of steel-framed buildings.